Hagi Kōgyō Bōeki K.K. (萩工業貿易㈱) was a Japanese company, based in Tokyo with a branch in Osaka. In advertisements dated from 1936 to 1942, the address was Kyōbashi-ku Ginza Nishi 7-chōme, 5 (東京市京橋区銀座西七丁目五) in Tokyo and Minami-ku Junkeimachi-dōri 3-chōme (大阪市南区順慶町通三丁目) in Osaka. In the "Kokusan shashinki no genjōchōsa" ("Inquiry into Japanese cameras") of early 1943, the Tokyo address was Ōmori-ku Tsutsumikata-chō 187 (東京都大森区堤方町187) and the company was simply called Hagi Kōgyō K.K. (萩工業㈱), perhaps by mistake. 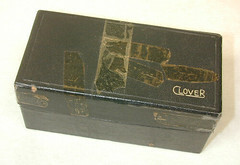 In Japanese, hagi is the name of a variety of clover and the company sold Clover cameras at least between 1936 and 1943. The Clover-Six and perhaps the Semi Clover were made by Ginrei Kōki. It seems that Hagi made all the Japanese 3×4 and 4×4 pseudo TLR cameras sold between 1937 and 1943. It is confirmed that it made the first of them, called Clover Baby Ref and released in 1937, and the last one, called Alma Baby Ref and advertised until 1943. All the other models are similar to either one of these, and they were certainly made by Hagi too. 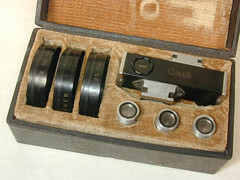 The device pictured below is a copy of the Zeiss Ikon Contameter set, with CLOVER markings. It is likely that it was made in the late 1930s or early 1940s for sale by Hagi, perhaps by the Ginrei company. 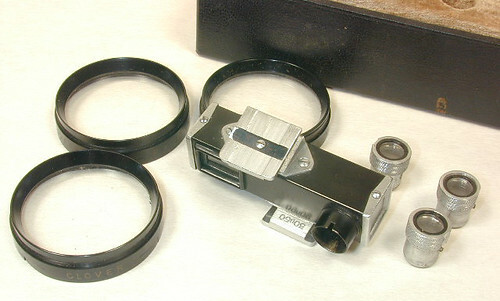 At the period, various Japanese companies made copies of complex Contax accessories: other examples are the Walz Contameter and the Echt copy stand. ↑ Source: advertisements reproduced in Kokusan kamera no rekishi, pp.68–9. ↑ Dates: Kokusan kamera no rekishi, p.336. ↑ Manufacturer of the Clover Baby Ref: the August 1937 advertisement reproduced in Kokusan kamera no rekishi, p.69, gives Hagi as the maker and distributor (製造発売元). Manufacturer of the Alma Baby Ref: "Kokusan shashinki no genjōchōsa" ("Inquiry into Japanese cameras"), item 194. This page was last edited on 18 January 2019, at 19:20.